In this part of Brooklyn, Flatbush Avenue becomes a major thoroughfare on its way out to the Marine Parkway Bridge and eventually the Rockaways. 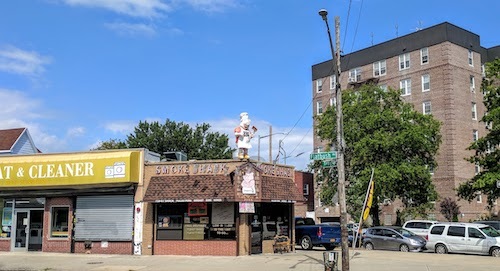 A rooftop pig in a chef apron marks the wedge of space between Marine Park, Mill Basin, and Flatlands, a tiny triangular corner has become home to Joeper's Smokeshack, a Brooklyn barbecue joint that replicates the dry rubbing and smoking styles of Memphis. On a lazy weekday, I wandered in and enjoyed the small space and had a chat with the friendly proprietor, a man with a thick Brooklyn accent but definite southern hospitality. Open for six years now, Joeper's seems to be the culmination of decades of work cooking meats in the backyard. The results are good. New York City is not known for its premium barbecue, but a few different styles have popped up here and there to generally mixed reviews. To my knowledge, Memphis-style barbecue is only represented by Joeper's, and a welcome addition to anyone seeking out good barbecue in the city. 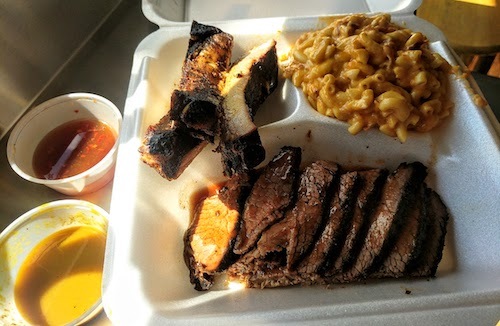 Shown in the top left of the photo above is a trio of Memphis-style ribs, which attain their greatness from a dry rub. People in Memphis do not get caught dumping sauces on their already perfectly smoked ribs. Knowing not everyone has this good sense here in New York City, Joeper kindly has spent years creating his own recipes for different barbecue sauces. Seen to the left are what he calls "hot" and "sour" when offering, both of which can go nicely with the brisket, served in thin slices. The "sour" version was most interesting, somewhat of a combination of different styles from the Carolinas with both mustard and vinegar. I also added a side of the bacon mac & cheese ($3.50), which rounded out the plate very well. A bottle of bourbon used to sit in the window and is still the most important ingredient in the popular bourbon bread pudding, if you happen to have any space leftover for dessert.